No one has ever driven a Beetle to blend into the crowd. Ever since its inception many decades ago, people have been driving the Beetle to make a statement. The quirky, fun nature of the Beetle has drawn in customers over many generations, and VW’s newest incarnation of the classic car aims to make as bold of a statement as any Beetle has done before. 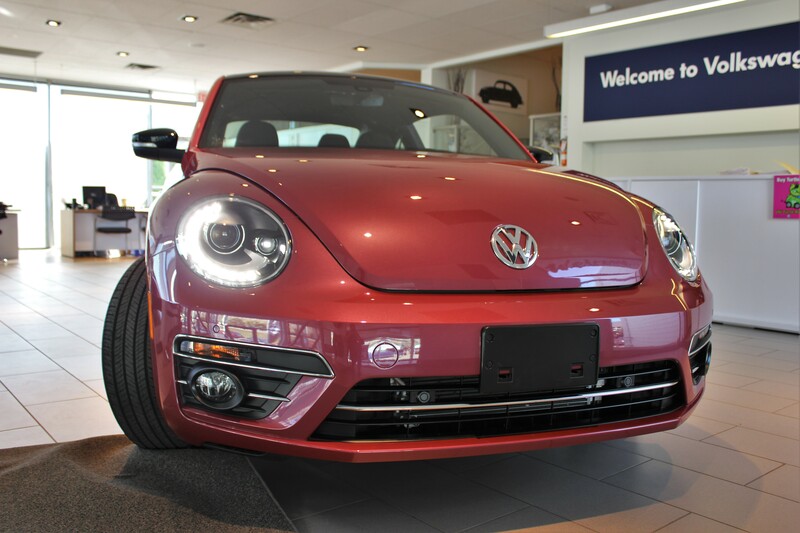 Meet the 2017 Pink Edition Beetle, available now at Volkswagen of Kamloops. The 2017 Pink Edition Beetle features a stylish yet subtle fresh fuchsia metallic exterior that will instantly get your attention. It features bi-xenon headlights, LED tailights and chrome accents, as well as a bold pink spoiler. The 17? gun metal wheels, which are exclusive to the Pink Beetle, offset the vibrant nature of the exterior and really stand out in their own right. The ultra-comfortable cloth seats have the unique pink tartan stitching that will evoke memories of our classic GTI, and the piano black accents and pink trim throughout the interior gives it a fun yet classy feel. This Beetle is loaded with features and packs a punch under the hood, too. The leather-wrapped steering wheel comes fully equipped with cruise control, infotainment control and voice commands that are all easily accessible right on the wheel. It comes with our turbocharged 1.8L TSI engine, which pushes out over 170hp and 199 lb-ft of torque, and is paired with the 6-speed automatic transmission with tiptronic shifting. The intuitive 6.33? Discover media system also provides tons of functionality, including AppConnect. This allows you to connect your Apple or Android device directly, so you can have your texts, phone calls, maps, music and more right on the screen. Best of all, the Pink Beetle comes with the nine speaker Fender Premium Audio Systems, one of the best car audio systems on the market today. And there will won’t be any more fighting over the AC, as the Pink Beetle comes with dual-zone climate control in addition to three-way heated seats to make your ride just that much more comfortable. The combination of style and substance make the Pink Edition Beetle the perfect car to go for a long Summer cruise. Available for $30,905, this could be your biggest statement of the year. For more information or to schedule a test drive, contact our sales team here.